During his fourteen years as Yale’s chief investment officer, David F. Swensen has transformed the management of the university’s portfolio. 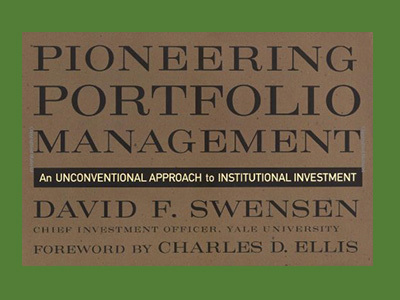 Largely by focusing on nonconventional strategies, including a heavy allocation to private equity, Swensen has achieved an annualized return of 16.2 percent, which has propelled Yale’s endowment into the top tier of institutional funds. Now, this acknowledged leader of fund managers draws on his experience and deep knowledge of the financial markets to provide a compendium of powerful investment strategies. Swensen presents an overview of the investment world populated by institutional fund managers, pension fund fiduciaries, investment managers, and trustees of universities, museums, hospitals, and foundations. He offers penetrating insights from his experience managing Yale’s endowment, ranging from broad issues of goals and investment philosophy to the strategic and tactical aspects of portfolio management. Swensen’s exceptionally readable book addresses critical concepts such as handling risk, selecting investment advisers, and negotiating the opportunities and pitfalls in individual asset classes. Fundamental investment ideas are illustrated by real-world concrete examples, and each chapter contains strategies that any manager can put into action. Posted in Financial Risk Management, The Library by Paul Dixon on November 5th, 2014.